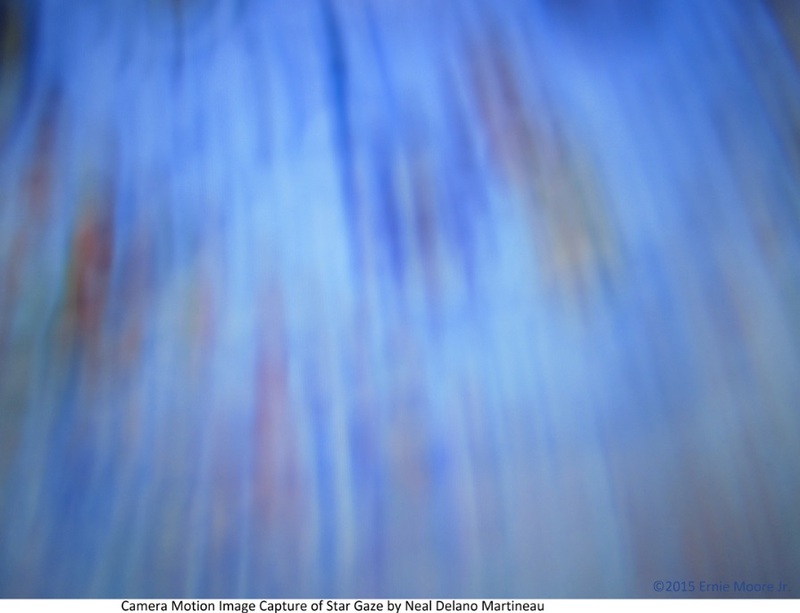 Photodigital Camera Motion Image Capture pulling light-stretching light of a photo-image of a painting Star Gaze by Neal Delano Martineau. Image within an Image, one might see figures resembling images of girls,little girls…I called this sisters. I saw different figures the second and later times. Concerned with being targeted as having girls on the brain (worse yet little girls), This was a piece with something to it. Not for the painting’s artist as it lacks structure perhaps, but for my initial interest in all this-Accidental Art/Discovered Art to have a source for a database to draw-upon for improving my sketching-drawing. I should include an attempt to use the structure I notice in the photodigital at the end of this entry [Note:I have to stop keystroking and put pen to paper to further that].-Ernie Moore Jr.
I’ll publish this then work on the drawing then have that as my next submittal might work.-Ernie Moore Jr.
Photographing a plaque got someone questioning me putting my name on the photograph–and person worked in Graphic Arts as a College teacher at least. It felt as thought there was a thought-implication of impropriety; except It was a photograph of a metal works No real place for me to be claiming it as mine…the bronze that is. 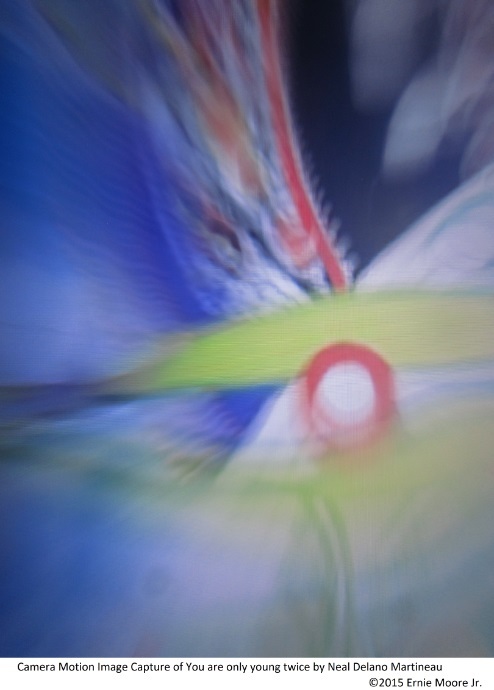 Here an artist who had become acquainted with me asked me to continue using my Camera Motion with his Art. I intend to do a site of camera motion with works of Mr. Martineau’s (Neal Delano Martineau– as the subject.-Ernie Moore Jr.
For now I’m trying to make a time-line. But I’ve been remiss to post here. This piece is relevant to work I do and prepared for web posting…Looking just a moment ago there seemed as though one might see a face if not a figure or two of bodies. Naming pieces can be significant. I saw an eye and a sword portion–that’s how I took it. 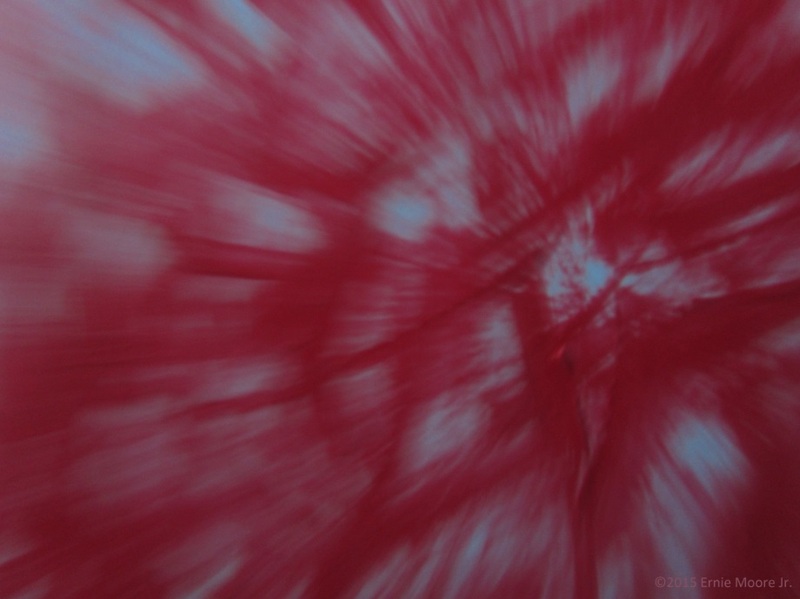 This one might get named something like on the Edge of My Mind to incorporate the thought of sword and the position above the eye which might go to thought or mind.-Ernie Moore Jr.
Photodigital Camera Motion Image Capture pulling light stretching light of Discovered Art red. There’s a focus perhaps a semblance of a person with hand to face–thumb-forefinger pinched touching lips. 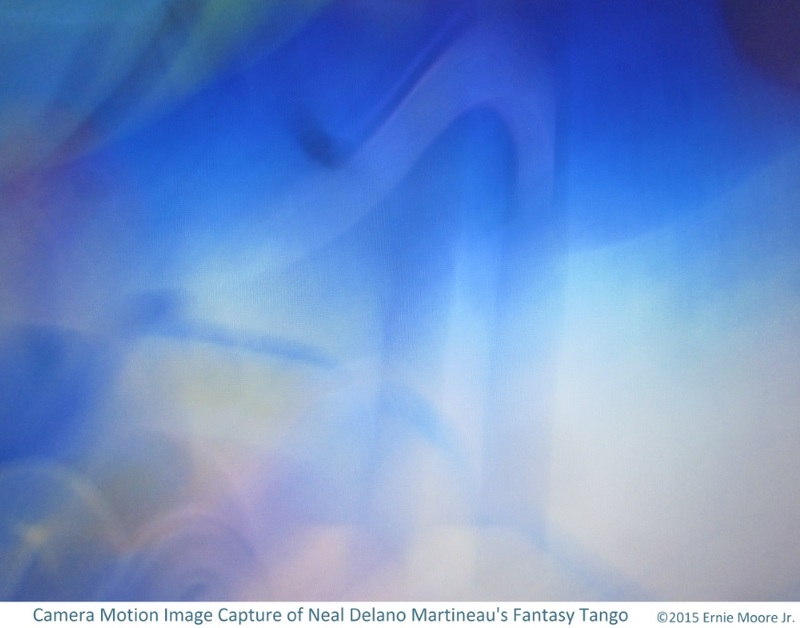 Other Image within an Image perhaps, also,-Ernie Moore Jr.
Photodigital of a piece of art called Fantasy Tango, by an artist named Neal Delano Martineau [Yes, he is related to…];pulling light stretching light. He’s actually interested in a collaborating–thinking his style with colorfulness lends itself to what I do here like this. I can use the works using less structure here while presenting Mr. Martineau with works of mine showing more structure. Given he has his own establishment Online I’ll link to the full image of Neal Delano Martineau’s work from which this is based.-Ernie Moore Jr. The thing here is, I’m pulling the light. But it’s not a thing in transition (is how I’m thinking I should think of it). It’s set and was worked on. Putting my copyright is fine as long as it’s not direct from the craftperson’s work. So this all is basically only for presentation and would need reworked for sale. I started off interested to remark that I am taking great care for the artist being recognized and not just anything else. He’d mentioned something that I understood I could do something like this and his response was favorable.-Ernie Moore Jr. 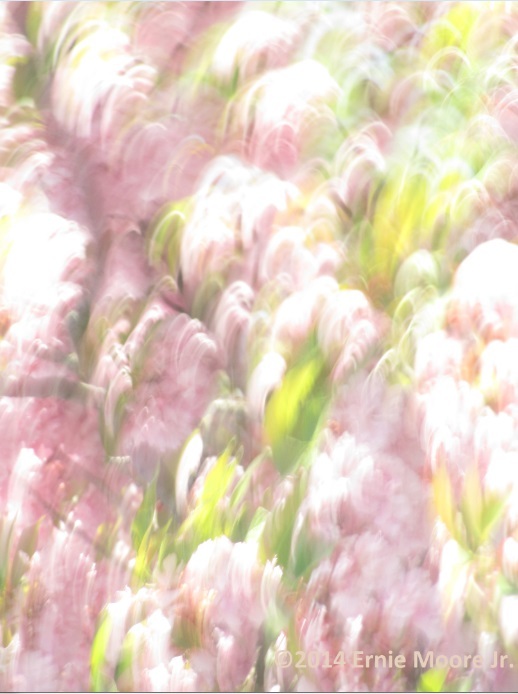 This piece is a digital photo camera motion image capture of blossoms. This combines Stretching Light with Light Drawing. Pulling fixed light source light across reflective subject matter–petals. Camera motion resulting in this sort of blending-looks to me as a kind-of art piece–painting-Ernie Moore Jr.